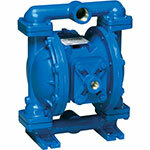 Air operated diaphragm pumps (AOD) or Air-Driven Pumps are ideal for moving sludge and slurries. Solids-laden fluids like sludge and slurry are hard to move — unless you’re using an air operated diaphragm pump. Air is driven into the bottom of the air cylinder, raising the piston inside and lifting the diaphragm. As the diaphragm is raised, the check valve ball on the intake side is lifted and liquid flows into the pump. When the piston has risen to the top, the pump cavity is filled and the pump is ready for discharge. Compressed air is then forced into the top of the diaphragm chamber, pushing the diaphragm down and evacuating the pump cavity. The check-valve ball on the discharge side is lifted and the pump is ready for the next cycle. Because an air operated diaphragm has limited moving parts, there’s almost nothing to maintain or wear out. Rebuild costs are reduced and are built for years of trouble-free operation.